One of the best post game quotes is Herm Edwards’s “Hello? You play to win game!” I admire his passion and intensity. While Coach Edwards was referring to a football game, his quote applies to all aspects of life. I’m fortunate to be able to mix my insurance business with my passion for catching marlin and sailfish. I find that individuals prefer to conduct business with professionals they trust and have a relationship with. The social environment of fishing events and tournaments provides for excellent opportunities to develop and enhance relationships. I also find that winning in business and tournaments has many similarities. It’s usually the best teams that achieve success. There is great satisfaction that comes along with achievement. I was fortunate to recently experience this from both a business and fishing standpoint with one of our clients. We had recently earned the privilege of providing employee benefits coverage for this client’s 900 + employees. Obviously, an account of this size involves a cohesive and dedicated team of insurance professionals. It was very rewarding for all involved. I was further privileged to be invited as a guest aboard the client’s Viking 70’ “Krazy Salts” during a recent Bahamas Billfish Tournament. My role on this team was different. Instead of playing quarterback, I was more of a receiver. I believe the perspective you gain from accepting different roles enhances a persons overall development as a team player. Instead of making a conservative choice of fishing the typical waters off of Marsh Harbor, Capt. Keith Greenberg made an aggressive decision to fish waters further south. The philosophy of the greater the risk, the greater the reward, paid off. I admire this type of thinking. We were fortunate to catch and release three blue marlin and a sailfish, of which enabled us to get off to a good start. With the rest of the fleet closing in, the last day again brought about a bold decision to fish an area we had not previously fished. 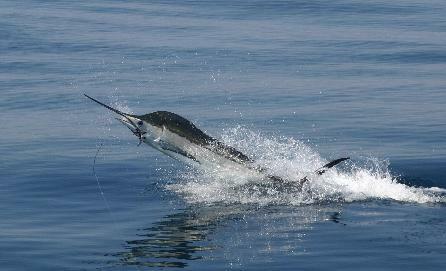 The reward was another blue marlin and a white marlin, of which clinched the win. I’ve certainly been on the non-winning side of things many times. However, I’ve always dedicated myself to give everything I have to be the best I can be. I play to win the game. If you give anything less than your best, you’re short changing yourself as well as your team. When you prepare yourself and team the best they can be prepared, success will come.